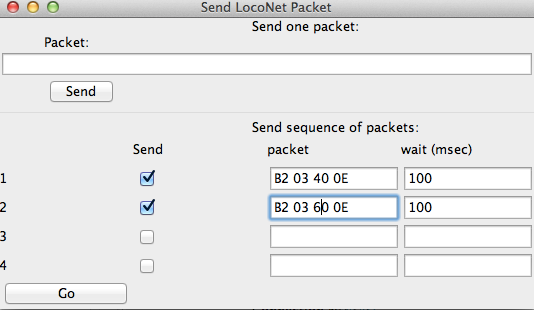 The "Send LocoNet Packet" tool lets you directly command LocoNet devices. It works best in combination with the "Show Raw Data" option in the LocoNet Monitor, because packets are entered here in raw hexadecimal format. 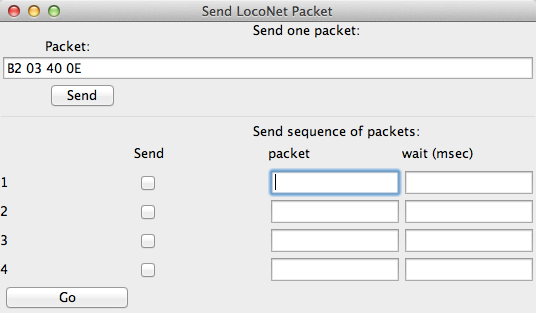 The top section of the window lets you send a single LocoNet packet. Just type the packet contents as hexadecimal numbers, for example "83 7C", and click "Send". You should include the byte for the checksum at the end of the message. The bottom section lets you enter from one to four packets that will be repeatedly sent in sequence, with user-defined delays in between. Press the "Go" button to start the transmission sequence, and press it again to stop the sequence.